I can't overstate the significance of "instantly"! I'm trialling a working process that makes very heavy use of spaces. Heavy enough that any delay when switching spaces is making it essentially unworkable. I made a change — turned "Reduce Motion" on — which I think sped things up, but nowhere near enough. I need the delay to be as little as it is when, for example, switching windows within the same app+space i.e. instant. To demonstrate the issue, open a few applications across a couple of spaces, then try to cmd-tab between a) apps on different spaces b) apps on the same space. Note that, even with "reduce motion" enabled, switching is much faster within a space. I'm running a MacBook Pro Retina Mid-2014, macOS 10.13.3, with 10 workspaces configured. My preference would be for the animation to be totally eliminated for every switch-spacing mechanism. However, my main method is going to be using Ctrl+[1-0] to switch between 10 workspaces. 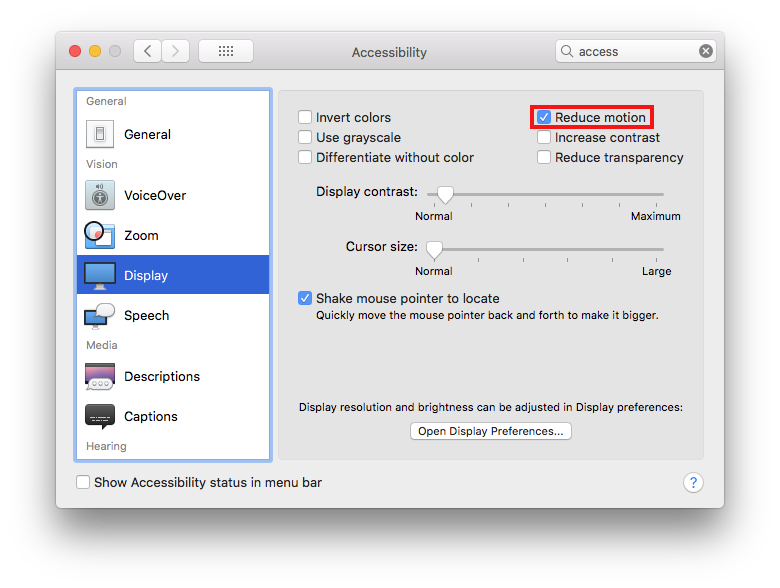 I recommend the option System Preferences > Accessibility > Display > Reduce motion. This causes the transition to become a simple fade, which is also much quicker than the screen pan especially when using ctrl+1, 2 etc shortcuts. I also use this option on iOS for similar reasons. There's also TotalSpaces2 which apparently allows complete removal of the transition. I've not used it myself though. Not the answer you're looking for? Browse other questions tagged macos high-sierra performance spaces . How do I speed up the animation time for switching between desktop spaces? How can I disable Spaces in Lion?